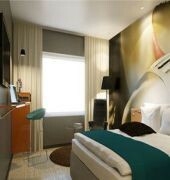 Comfort Hotel Malmo is a modern and urban city hotel offering effective solutions. 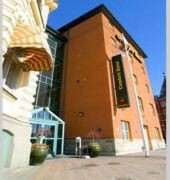 In January 2011 the hotel was built out with 180 rooms and now has a total of 293 rooms and is Malmo's largest hotel. 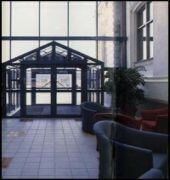 We are located 200 meters from The City Tunnel and the Central Station, airport buses and train to Copenhagen. Within a few minutes walk is the center of Malmo with a wide range of restaurants, culture and shopping.Rooms are tastefully decorated with lovely Hilding beds, Jetson chairs and tiled bathrooms with shower or bath. We also offer compact living in some rooms where you can stay up to four persons in each room. 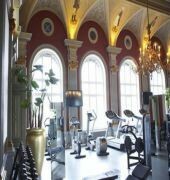 All rooms are equipped with LCD TV, telephone and wireless internet.We also offer our guests free of charge to train in Malmo's coolest gym. The Boxing ring is on place so it's just to get up and start to fight. 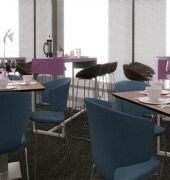 Boxing gloves and kick and punch paddings are available from the reception.In our reception / bar that, open 24/7, we sell light meals, salads, sandwiches and soups and various beverages. The restaurant Plectrum is open every day from 6 P.M except on Sundays. The chefs serve organic alternatives as a healthy burger and a classic Swedish shrimp toast. The bar open at 5 P.M.